It is our desire as a music ministry, to creatively connect the hearts and minds of people to the heart of God so that their lives will be full of worship every day of the week. We want to provide climate in which worship and personal spiritual growth occur and as part of the music ministry you can use your talents to bring that goal into reality. Regardless of your age, at BBC we have a place for you to get involved in the music ministry and use the gifts God has blessed you with for His glory! 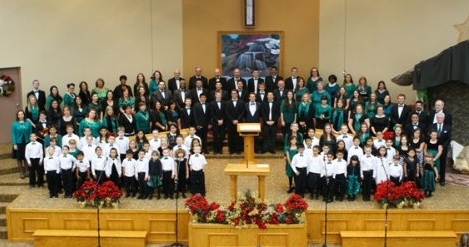 The Choir and Orchestra is the hub of the music ministry. They are dedicated servants of Jesus Christ who enjoy a major role in leading the congregation in worship during the Sunday services. There are always openings in the choir and orchestra for faithful people who have a sweet attitude and a passion to use their musical talents and gifts for the Lord. Rehearsals are on Sunday evenings from 4:00 until 5:30. Anyone may visit rehearsal to experience a taste of what it is like to be a part of the music ministry community at Bible Baptist. There are many opportunities to serve "behind the scenes" in our music ministry throughout the year and for special occasions. Another opportunity to get involved is in our media department. Our media ministry supports the weekly worship services and offers those interested in audio production an opportunity to receive training and experience. The services are enhanced greatly because of the outstanding and creative ministry of those who serve in the media ministry. Our prayer is that you will find a place to serve Christ as your heart draws closer to Christ through worship here at Bible Baptist Church. The purpose of the music ministry is to glorify God by exalting the Lord Jesus Christ, edifying believers, and evangelizing unbelievers, through passion and excellence in our music and message. For more information on how you can get involved, please contact our Music Director, Kelly Counts.